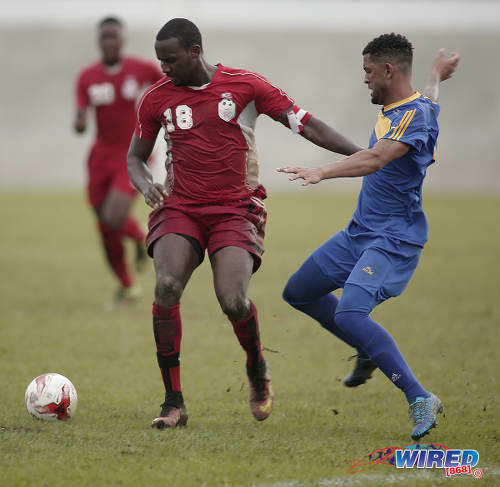 Despite being the all-conquering team in the Trinidad and Tobago Super League (TTSL) in 2017 when they walked away with both the League and League Cup competitions, Guaya United are still to receive their prize money. The TTSL membership had agreed to play without monetary rewards for the 2017 League competition so the southerners haven’t got any money for their League victory. But the Caribbean Football Trust Limited (CFTL) had committed to sponsoring the League Cup to the tune of TT$100,000 so there really is no reason why the champions should still be without their cash prize. Photo: Guaya United forward Carlon Hughes (left) is congratulated by his teammates after completing a beaver-trick against Cunupia FC at the Guayaguayare Recreation Ground on 9 July, 2017. On 5 June, 2017, Look Loy—then in an interim role—signed off on an agreement with CFTL chairman Chris Anderson to the tune of TT$550,000. The sponsorship was due to cover two tournaments, with TT$200,000 going to the League Cup and a further TT$350,000 going to a “Winner takes all” Power Eight tournament, which never materialized. 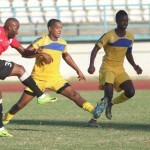 In an enthralling League Cup final at the Ato Boldon Stadium, Guaya defeated Prisons FC to cop the top prize. Second-placed Prisons were supposed to pocket $50,000 while losing semi-finalists Cunupia FC and UTT were to receive $25,000 each. But CFTL are yet to hold up their end of the bargain. Look Loy, who is also the founder of 2016 TTSL champions FC Santa Rosa, indicated that his club was one of eight TTSL teams which have not received their full winnings for their exploits in the 2016 TTSL season. Quite clearly distressed that the man who has so far failed to make good on his contractual commitment is a former Trinidad and Tobago international footballer, Look Loy stressed that it was part of a bigger problem of sport in the country which sees contracts not being treated with the respect they deserve. Like Look Loy, Guaya manager Jameson Rigues is hopeful that Anderson will keep his promise. And he implies that he expects the president to follow through and push the sponsor to make good on his promise. Photo: TTSL president Keith Look Loy (left) and CFTL chairman Chris Anderson agree sponsorship for two cups for the 2017 TTSL season during a press conference at the Hasely Crawford Stadium on 5 June 2017. 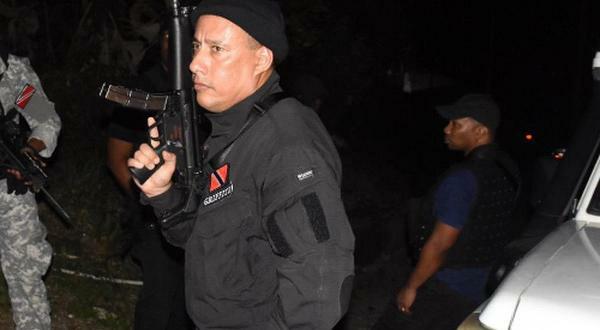 Because he also sits on the TTSL Board as first vice-president, Rigues is between a rock and a hard place, feeling the heat from his own players as well. Last June when they signed on the dotted line at the Hasely Crawford Stadium, all eyes were on Anderson and Look Loy. And all ears were tuned to Anderson who had some pretty fine words to share with those present. 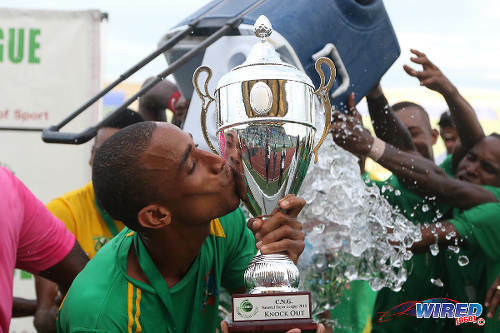 Photo: Guaya United player Kerneal Hagley enjoys a tender moment with the 2015 CNG National Super League Knock Out trophy. Rigues tried to see the positive side. 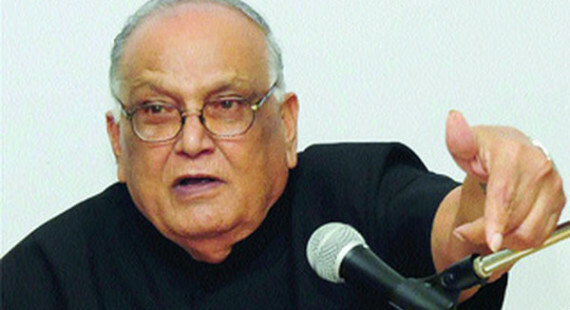 Less disposed to be generous or optimistic, Look Loy assured Wired868 that the TTSL will no longer be dealing with CFTL. Look Loy was happy to note that Guaya, Prisons, Cunupia and UTT have all declared their intention to participate in the 2018 TTSL season which is currently carded to start on 10 June. 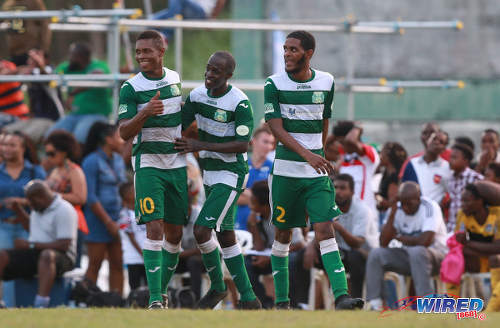 Rigues simply cannot envisage a TTSL without Guaya United, otherwise known as the “Green Army,” and gave the assurance that, even if the CFTL does not meet its contractual obligation, the club and the community will do all in their power to ensure that the players are well looked after financially. According to Rigues, the TTSL Board does not at the moment have any plans to take legal action to force CFTL’s hand. 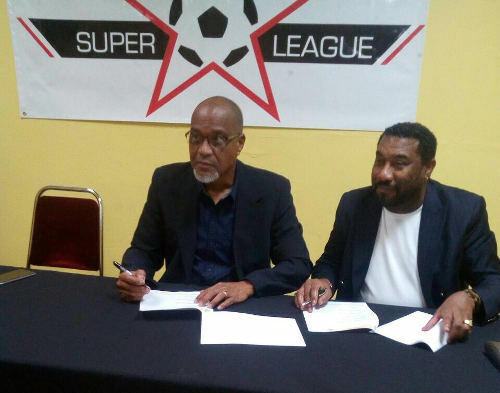 Look Loy, however, pointed out that, should CFTL attempt to venture into any similar sponsorship deals in the coming months without first honouring its contract with the local league, the TTSL would be forced to act. 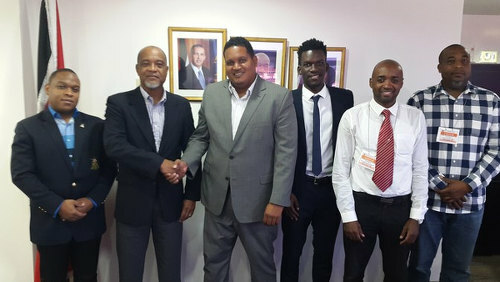 Photo: Then TTSL interim executive (From left to right) Lt Ryan Ottley (TTSL interim VP), Keith Look Loy (TTSL interim President), Minister Darryl Smith, Camara David (TTSL Secretary), Kester Lendor (TTSL interim Assistant Secretary) and Quincy Jones (interim Board member). Defence Force football team manager Ryan Ottley, who held the position of interim vice-president when the CFTL deal was struck, believes the current situation could have been avoided. He said he raised an alarm shortly after the June 2017 signing. Ottley suggested that Look Loy’s handling if the CFTL matter is flawed as indeed is his handling of sponsorship matters in general. “Writing the man is good, but when it was time to bring the sponsor on, you travelled to the States and sat and talked with the guy,” said Ottley. “If somebody owes me money, I’m making sure and get that money. We had a contract and I held up my end of the bargain. […] That could never be business. 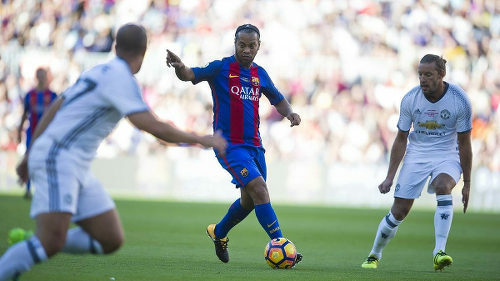 Photo: Former Barcelona and Brazil star Ronaldinho (centre) in action against Manchester United in a Legends exhibition contest in June 2017. 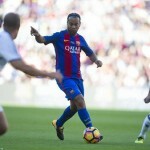 Ronaldinho was scheduled to come to Trinidad last year as part of a CFTL “All-Star” game. Look Loy conceded that the season had not gone entirely swimmingly, the Power Eight competition not coming off and the much ballyhooed TTSL / CFTL “All-Star” game not going ahead as planned. However, he explained, neither he nor anyone within the TTSL could reasonably be blamed for CFTL’s slowness in meeting its obligations. And it was the Trinidad and Tobago Football Association (TTFA) which was at fault for the cancellation of the “All Star” event because it had simply never given the green light for it to be staged. All of that, Look Loy assures, is now history; there are brighter days on the horizon and, come what may, there will be monetary incentives for teams in the upcoming League campaign. Look Loy indicated, that on 3 March, the membership agreed that part of the money clubs pay for registration will be going towards the payment of prizes come the end of the season. 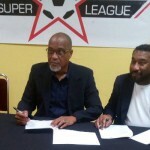 The TTSL president said that the League is still in talks with sponsors and a prize structure will be made public when the season gets under way in June. Photo: Bethel United defender Makan Hislop (left) shrugs off a challenge from FC Santa Rosa attacker Rashad Griffith during TTSL One action at the Arima Velodrome on 18 June, 2017. The registration fee for clubs in TTSL League One is TT$45,000 while the League Two fee is TT$35,000. The deadline for payment of these fees is 30 April and clubs failing to meet the deadline run the risk of being kicked out of the League. Even before the 30 April deadline, there is a 31 March date by which clubs must prove to the League that they are functional by producing financial audited statements, minutes of their last AGM and other pertinent documents. According to Look Loy, Club Sando, Moruga, Marabella Family Crisis Centre and FC Santa Rosa have already met the functional club requirement and he is confident that other clubs will soon follow suit. Ottley is of the view that the League should not be too quick to sideline its member clubs. And he reckons that no final decision on prize monies should be made before the membership is in possession of official information on the League’s operational costs. Look Loy, however, argued in favour of a tough stance. Photo: QPCC winger Jason Devenish (left) tackles UTT midfielder Stefon Pierre during 2015 CNG NSL Championship Division action at UTT Grounds, Arima. Why he don’t cuss them???? ..The clubs are not the only victim here. So too is TTSL. Guaya representatives – the Brothers Hagley – have sat in our meetings and helped the league to make decisions for 2018. Running football in TT is not as easy as some think. Faced with CFTL’s failure to honour its commitment we could moan and fold up or we could press on building on the good foundation we laid in 2017. Football continues as it must.. This situation is rather unfortunate to say the least. The failed contractual arrangement is not the responsibility of the clubs but the responsibility of the League. Arrangements should be made by the League to honor its promised prizes to the winning respective teams. How do we expect growth and development in the League when the very thing that motivates the players and clubs to participate is not honored. Further to that, preparations are being made for the 2018 season without settling outstanding commitment from last season and the teams that do not pay the registration and submit there documents will have to sit out….really? The TTSL has something in its short existence that the PRO league doesn’t, which is support for the participating teams from there respective communities. I really hope that these ills can be rectified at the soonest as my Community loves our team and want to see the League grow to a level that the Pro League never achieved. Disappointed Guaya United Football Club / d GREEN ARMY Fan. ..TT Sport is in difficult times but football goes on. For the record, the membership were invited to meet with Anderson to discuss the CFTL sponsorship. The meeting took place at Police Mess Hall on Long Circular Road. At the end all in attendance signed off on the agreement. Ottley himself left after a smiling handshake with Anderson. Now he has issues. So be it. I understand football politics. The League is is being given the short end of the stick but football goes on. 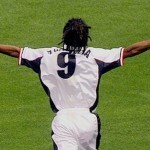 The new season is coming and the serious clubs will play it.. Regarding TTFA requirements, the League has consistently demanded clubs do the needful and has made accounting services available to members. But they need to walk the last mile for themselves. I make no apologies for adopting that stance. Serious times demand serious people.. It is unfortunate that Mr. Look Loy will take a handshake and a smile to mean satisfaction, throughout the entire meeting, I was the only person drilling Mr. Anderson on the content of the contract. I informed the membership that the contract is vague and the potential risk that was before us. I agree with Jason Lexo Alexis that the responsibility of contractual obligations and the proper execution is the responsibility of the League, it was evident in meetings prior that Mr. Look Loy was not informed of the contents of the contract and could not offer the membership any explanations. It was also evident that Mr. Look Loy did not want the members of the Interim Board to review the contents of the contract as it was with held from us and presented to the membership as a document that the Board recommended. 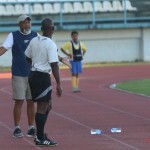 ..I should add that the semi-finals and final of the CFTL League Cup were staged by TTSL. We mad a profit of almost TTD 4OK. Members have already agreed that the League will again host these matches and either 1) pay the participating teams an appearance fee or 2) pay prize monies from the profit. We are not lamenting the 2017 issue. We moving on in the most self-reliant manner possible..
..Other than SSFL (because of Sportsmax), no football league in TT has meaningful sponsorship. None. League survive by their own means. In 2017 TTSL clubs bit the bullet and agreed to play the league competition without prize money – this in order to establish our own league. The clubs have agreed to apportion a percentage of registration fees towards 2018 prize money – in the absence of external sponsorship. THIS is why I have maintained as TTSL president that we must operate within our financial means and this worked very well in 2017. With that base we are now exploring how we could not just mark time but GROW..
..No sponsor pays up in advance. None. TTSL had a small sponsorship agreement with TSTT last season and we got the cheque last week. Remember, TT is a buyers’ market..
You mean in T&T, no sponsor believes in T&T sports growth and development enough to put up front sponsorship. I think the TTSL needs to improve upon their negotiation and marketing skills otherwise do not complain when payouts fail to materialize when due. ..We all live, operate and play in TT. Thank you for the advice.. The football clubs should require that the league bank, in escrow, the promised funds. No club should agree to participate without such proof. 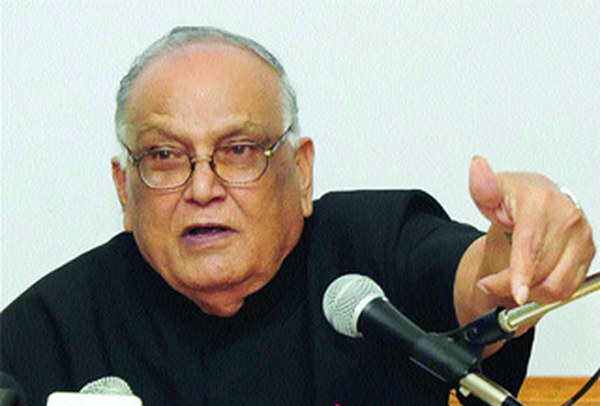 The distribution of funds should be the responsibility of a third party! This approach, I believe, would assure prompt distribution of funds according to outcome of the tournament. This suggests that the League itself is untrustworthy, which on its face is lacking in basis. Second, how could the clubs even make such a demand of themselves, seeing the close nexus of club and League leadership? Nigel S. Scott No… it suggests the league needs to be financially savvy and to be better negotiators with their sponsors. Currently, they have a lose-win relationship with their sponsors whereby the league is the loser. It’s time the league steps out of the dark ages. Kenneth, see what Keith said about sport sponsorship in TnT, it is a buyer’s market. What you say makes all the sense in the world… in theory, but not all parties to a contract come to the table on even footing. Suggesting escrow means that the fault lies with the League, that they have the money and won’t pay out. The real issue is lack of funding. An escrow requirement is meaningless without actual funds to hold in escrow. Nigel S. Scott Honestly, I respect him but I disagree with his position/stance on the subject. This problem is not new! The leagues have been at a disadvantage for decades. We can’t love football that much to continue leaving the negotiation table at a disadvantage whereby every season we gave to beg for prize moneys after the league and its clubs had enthusiasticly promoted the sponsors every game whole season… Nah man. Time for the BS to stop. Kenneth in a situation where sponsors are hard to come by, the ones that do are negotiating from a position of strength. Not sure how mere words or change in mindset is going to change that. Nigel S. Scott Negotiation is an art, a skill. The sponsors need the exposure as much as the league needs the money. The league needs to expand their search for sponsors. Earl Mango Pierre Agreed, Mango! I was trying to be as diplomatic as possible. So I had to use a bunch of sentences instead the word… corruption and the phrase… gross self-enrichment! ..No mess. TT Sport is in difficult times but football goes on. For the record, the membership were invited to meet with Anderson to discuss the CFTL sponsorship. 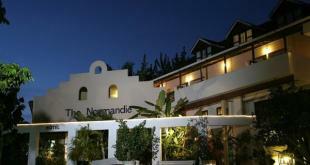 The meeting took place at Police Mess Hall on Long Circular Road. At the end all in attendance signed off on the agreement. 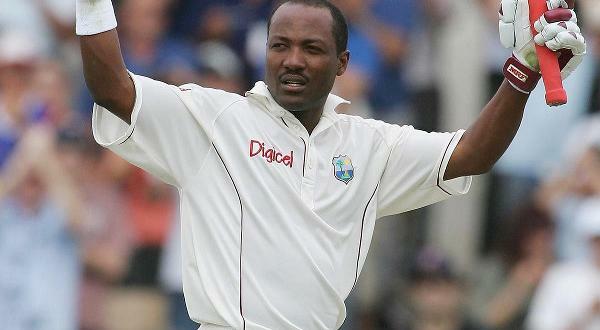 Ottley himself left after a smiling handshake with Anderson. Now he has issues. So be it. I understand football politics. The League is is being given the short end of the stick but football goes on. The new season is coming and the serious clubs will play it..
..For the record, the membership were invited to meet with Anderson to discuss the CFTL sponsorship. The meeting took place at Police Mess Hall on Long Circular Road. At the end all in attendance signed off on the agreement. Ottley himself left after a smiling handshake with Anderson. Now he has issues. So be it. I understand football politics. The League is is being given the short end of the stick but football goes on.